Much of the plastic that we throw “away” ends up in our oceans. The Arctic Sunrise ship is journeying to the largest trash vortex in the ocean with the goal of identifying the microplastics found there. A Manta Troll is deployed to collect micro plastics to study from aboard the Greenpeace ship, Arctic Sunrise, off the Southern California coast on August 2, 2018. 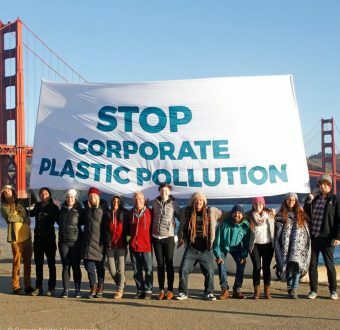 The Arctic Sunrise is en route to the Great Pacific Garbage Patch with the goal of identifying the plastic that corporations would like to think are simply thrown “away”. All over the world, people are doing their part to help tackle the plastic pollution crisis. They are holding cleanups with brand audits to identify the corporations that are responsible for the pollution in their own backyard. 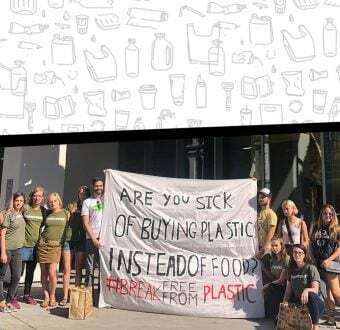 They are pressuring retailers and the world’s largest companies to reduce their single-use plastic footprint. And they are working towards building a future that’s based on reuse and new delivery systems for products. But corporations continue to sell the narrative that if we just recycle more, and do our individual part, we’ll be just fine. They tell us to throw things “away” properly, but we know the reality is there is no “away.” Recycling programs are being scaled back around the world, as foreign waste bans are put into place. Plastic waste thrown away in the United States is sent to other countries, many of which are countries in Asia that don’t have the infrastructure to properly recycle or sort someone else’s mess — let alone deal with the ridiculous plastic packaging companies have forced upon them already. So the vast majority of our plastic waste ends up in landfills, incinerators, or the ocean, where it remains forever — out of sight and out of mind for those making a quick profit off of products wrapped in plastic. 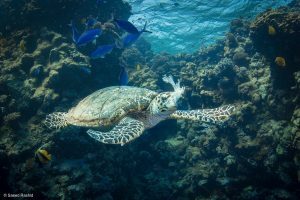 A Hawksbill turtle feeds on a piece of plastic near the reef Big Gota in the southern Egyptian Red Sea. 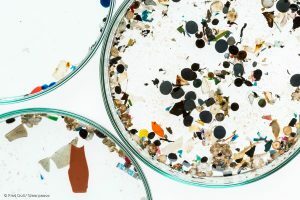 Plastics, unfortunately, don’t just decompose or disappear when they enter our oceans — they break up into smaller and smaller pieces called microplastics. Microplastics harm marine life as they look and smell like food. These tiny pieces of plastic are consumed by fish and other creatures, before moving up the food chain and into our own bodies. Plastic has been found at the deepest point in the ocean, the Mariana Trench, as well as in the Antarctic and the middle of the ocean, and in the Great Pacific Garbage Patch. Even when we can’t see it, plastic pollutes every corner of the globe. The Great Pacific Garbage Patch is a vortex located in the middle of the Pacific Ocean, halfway between Hawaii and California. Microplastics congregate in the Garbage Patch due to ocean currents. The Greenpeace ship the Arctic Sunrise has departed for the Garbage Patch with the goal of identifying the plastic that corporations would like to think are simply thrown “away”. 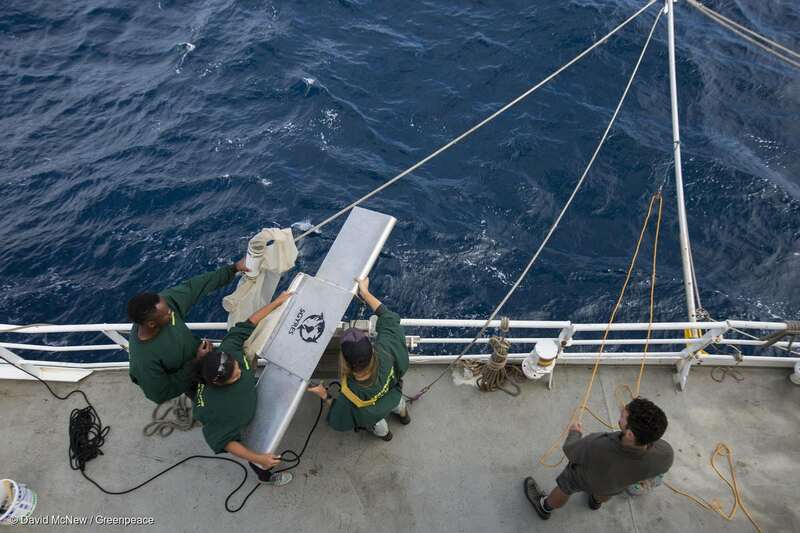 During the transit, the crew on board will document the type and quantity of microplastics found in the Garbage Patch, search for any branded plastic pollution we can find hundreds of miles from shore, and document how it travels through the ocean, capturing underwater footage of the soupy plastic mess that is now twice the size of Texas. Shot of microplastics from water samples taken by manta trawl. They may seem small but they’re creating an incredible problem for our oceans. The Arctic Sunrise is traveling to the Great Pacific Garbage Patch to show the world what “away” really looks like, and to demonstrate that no matter how hard we try to clean up plastic pollution, the scale of the problem cannot be tackled through beach cleanups or mere recycling alone. This crisis requires immediate action from the world’s largest corporations like Pepsi, Nestle, Procter & Gamble, and Unilever. It’s time for these corporations to stop making so much wasteful plastic. 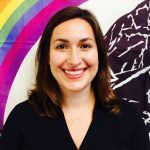 Kate Melges is an oceans campaigner based in Seattle. She leads Greenpeace’s Ocean Plastics work. Kate’s focus is ending the flow of plastic pollution into the ocean.